Time was of the essence and we couldn’t cavort up here much longer, besides, the ache at the back of my head was still nagging like an aggravated fish-wife on PMS. About halfway back to Stella who should we see, but David! A porter under each shoulder, the big man looked absolutely beaten. He had his sunnies on, pale in the face and incomprehensive to speak to, just incoherent babble. It was amazing this mans will-power. He just didn’t know when to say ‘no más’! Wynhand immediately took him on his shoulders and turned back around to Uhuru! Now that’s what I call brother-love. What an inspiration, and no matter how he was feeling, was ready to walk back with him. Now it was revealed later by Tom that David’s state was not on. He was angry that he did not listen to the guides- he could have done himself serious injury. We were told of a time when one poor soul, who on arrival at Stella, insisted he carry on, contra to the guides advice. He dropped dead moments later. A sad warning. Listen to what your body is telling you. In a situation like David’s, the only thing you can do is descend to avoid injury. Nevertheless, I was in a huge hurry. I’d seen enough. Keep the sunrises and snow, out of my way, I was heading down and I didn’t care who was coming with me. I basically skied all the way down, slipping and sliding, sometimes rolling, I was hell-bent on descent! Took around 4hrs to get back to base camp. The next of my party stumbled into camp about half hour later. I slept. And I slept like never before. In total the hike to the summit and descent back to base took 13 agonising hours, injury free!! All I took was a single paracetamol for the busting head on the summit- and it did absolutely nothing! The rest of the troop arrived within the hour. At about 4pm we assembled at the mess tent for lunch/dinner to replenish our strength. The 3hour nap actually did me wonders. My knees and quads were totally non-responsive though but my lungs had survived without a problem and I think I was reasoning ok- so think the old brain was still in order! David who had been helped all the way back down to Barafu by his 2 loyal guides was in a state. He still wasn’t with us nor the program, as he tried sleeping on and wouldn’t budge on our departure. 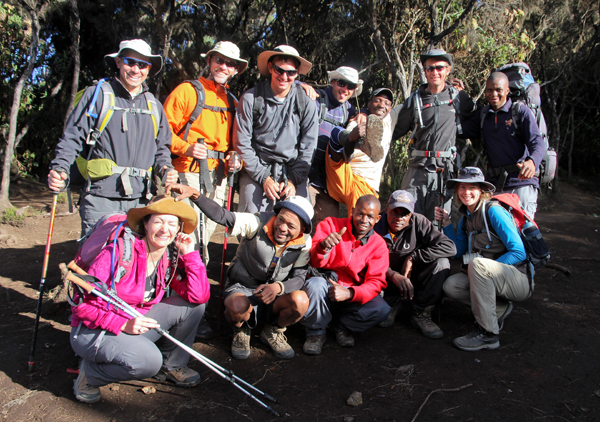 The way the tour was designed was that we arrive back at Barafu, short sleep, eat and then we leave the same day, descending to Mweka encampment which is back down at 3100m. This was a fair walk, again all down hill for the next 3 hours. David, when finally being able to string a sentence together was not budging. Sitting in his tent just wanted to sleep. He was sick, but he was going to be more sick if he stayed on this altitude, we were assured by Tom. David insisted on a helicopter evacuation. This was not going to happen as he was able to walk, albeit falling into that category..but didn’t really want to. I couldn’t blame him- he really looked bad. His brother eventually ‘motivated’ him through various forms of physical and linguistic techniques within the tent. (Actually beating the crap out of him and swearing) while we all watched the tent shuddering! 10 minutes later we ALL left Barafu. During the decent to Mweka, David collapsed and couldn’t go on. The ever loyal and supporting porters sent for a stretcher. A few hours later the stretcher arrived (hell knows where from) on large bicycle-type wheels. 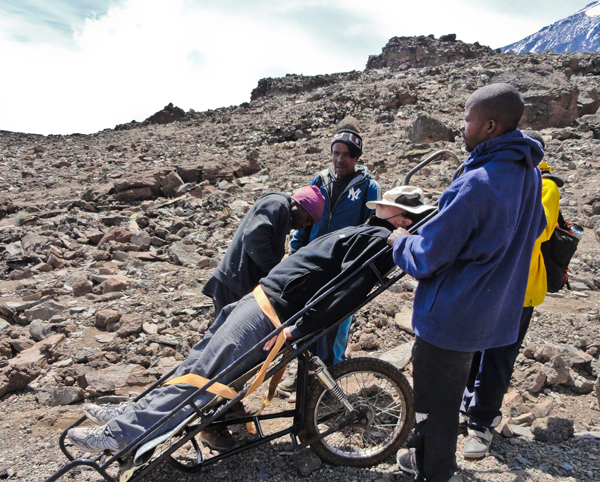 He was strapped in and escorted via about 6 people down the slopes of Kilimanjaro. The walk down was fun, headaches completely gone now and chatting amongst ourselves like bank-robbers after a cash heist. 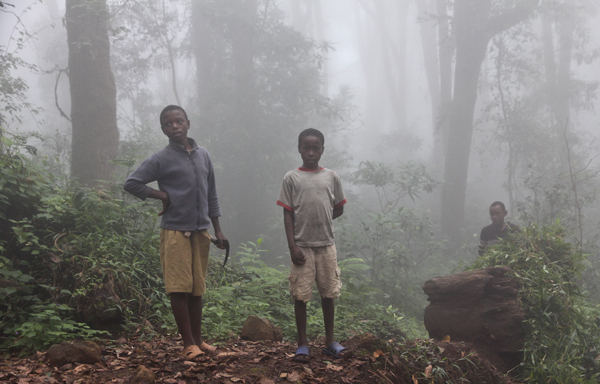 The vegetation quickly returned at around 3500m and the mist was back. It was great because the route varied from on the way up. And before we knew it, we were entering tree terrain. It certainly was a speedy descent relative to the climb! It would take a day and a half to reach the foot. 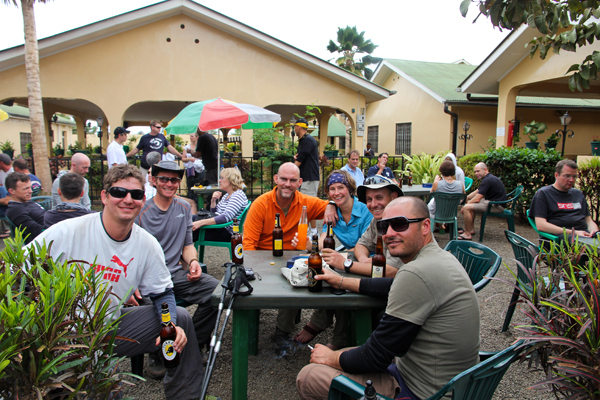 By reaching Mweka we were all hell-bent on a beer which was readily available at the camp office when we signed in. The trip still not over, we were at altitude but the 3100m now felt like we were on the coast already! The night consisted mostly of more beer and an early crash in the last of the camps. Even our Rasta friends were still floating about amongst the survivors, although they probably weren’t 100% sure if they were on the way up or down the slopes.